Christmas is almost here. Many of us have memories of "Christmas Past." Some may think of when they were very young and still thought that "Santa" brought our gifts. 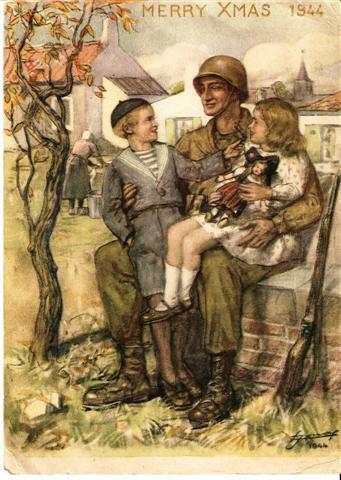 Others may think of the first Christmas when they were in the military service. Others may be of the first one when their first child experienced their first christmas. Some may think of the "Christmas Truce" that occurred on December 25, 1914 on a battle field in France. What ever we think of at this time of year, I always think of the saying, "Peace on Earth and Goodwill to all." 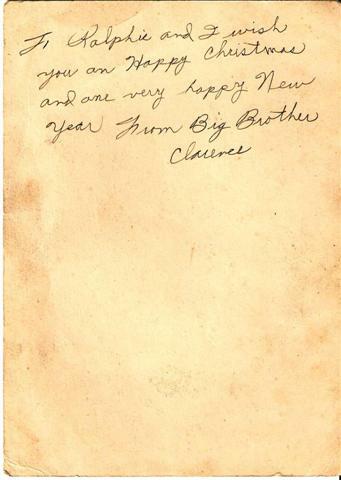 I don't remember this particular Christmas, as I was only four, but it was mailed just before my oldest brother was caught up in the Battle of the Bulge. He had just arrived in Bastogne for 24 hours liberty, and instead of rest, he was given a rifle. He spent several days getting back to his howitzer, and escaped unharmed. I've shown this before, but it's timely. What a wonderful memory and very personal artifact from the time. Very interesting that Big Brother Clarence had a better understanding of English than can be said for many people today. As he has written it, it should be 'an', not 'a', before 'Happy', as indeed before any word beginning with 'H'- an Hotel, an harmonica etc. Merry Christmas to all and Especially to my Friend RDR and Family!